I learned today that, the parent company of The Sun newspaper has now changed its name to News UK. 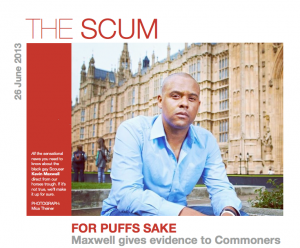 I’ve always wanted to run a newspaper (like the other Maxwell), so thought I’d launch one. Well, just the front page anyway – for now. Seeing the shocking Gay Hate headline from the Daily Mirror the other day about the judge in the Stuart Hall trial got me thinking too, what headlines would the tabloids publish about me? I’m of the belief that, if you keep on knocking at the devil’s door (like I have done with the Metropolitan Police), one day he’s going to open it. Unless of course, he’s on holiday! Anyway, I thought I’d come up with my own sensational Front Pages about myself – saving the others a job, and allowing them to concentrate on ‘high’ quality journalism for the public good. The first edition of The Scum is out later.